RC EYE OneCam TX is approximately 7.5 g in weight, it is a compact micro-camera with embedded 5.8 GHz wireless transmitter. It allows transmitting real-time audio/video signals specifically designed for short-range FPV applications, indoors and outdoors. Power input has been optimized for RC applications. It is compatible with the 5.8 GHz Video TX RX Set (20015RC) since it is designed to operate within the same frequency band. RC EYE OneCam TX adopts mini CMOS image sensor and mini wireless AV transmitting technology. Its volume is delicate and the AV effect is good. The wireless transmitting distance is up to 60 m and it works with low power consumption. 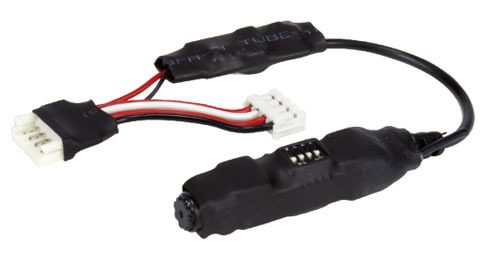 RC EYE OneCam TX is compatible with the RC EYE One / S LiPo battery. 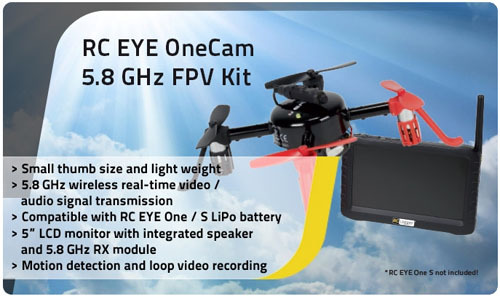 It can be easily installed on the RC EYE One / S.
Designed to be used in combination with the RC EYE OneCam TX, the 5.8 GHz RX LCD monitor is excellent for fun FPV applications to receive and record wirelessly transmitted videos. It consists of a 5” LCD monitor with integrated speaker and 5.8 GHz receiver. It is also a digital video recorder which supports motion detection and loop recording onto MicroSD memory card. Extra features include photo taking, video playback as well as auto shutdown/screen-off function.The extra AV IN/OUT port allows connection with additional NTSC/PAL AV devices. Comes with foldable stand and can be mounted on standard camera tripod with the included back holder. 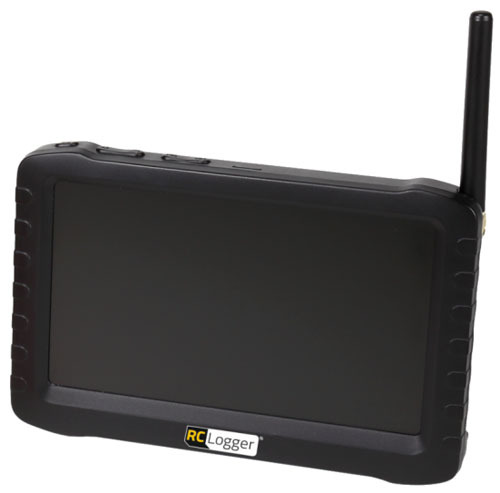 Compatible with RC Logger 5.8 GHz Video Transmission system.